Note: The publications are automatically numbered using the CSS content property and the before pseudo-element. These numbers are displayed in the Firefox, Chrome, Safari, Opera, IE8 and more recent browsers. Linda van den Brink, Payam Barnaghi, Jeremy Tandy, Ghislain A. Atemezing, Rob Atkinson, Byron Cochrane, Yasmin Fathy, Raúl García-Castro, Armin Haller, Andreas Harth, Krzysztof Janowicz, Şefki Kolozali, Bart van Leeuwen, Maxime Lefrançois, Josh Lieberman, Andrea Perego, Danh Le Phuoc, Bill Roberts, Kerry Taylor, and Raphaël Troncy. Best Practices for Publishing, Retrieving, and Using Spatial Data on the Web. In Semantic Web Journal (SWJ), 2018. Manel Achichi, Cécile Cecconi, Pierre Choffé, Bernard Jacquemin, Pasquale Lisena, Konstantin Todorov and Raphaël Troncy. Improving (Re-)Usability of Musical Datasets: an Overview of the DOREMUS Project. Bibliothek Forschung Praxis, Special Issue on Digital Musical Libraries, 2018. Raphaël Troncy, Benoît Huet and Simon Schenk. Multimedia semantics: metadata, analysis and interaction. Wiley-Blackwell, pages 1-328, July 2011, ISBN: 978-0470747001. Raphaël Troncy, Giuseppe Rizzo, Anthony Jameson, Oscar Corcho, Julien Plu, Enrico Palumbo, Juan Carlos Ballesteros Hermida, Adrian Spirescu, Kai-Dominik Kuhn, Catalin Barbu, Matteo Rossi, Irene Celino, Rachit Agarwal, Christian Scanu, Massimo Valla and Timber Haaker. 3cixty: Building comprehensive knowledge bases for city exploration. In Journal of Web Semantics (JWS), 46-47, pages 2-13 2017 (doi). Giuseppe Rizzo, Rosa Meo, Ruggero G. Pensa, Giacomo Falcone and Raphaël Troncy. Shaping City Neighborhoods Leveraging Crowd Sensors. In Information Systems, Special Issue on Mining Urban Data, 2016 (doi). Ahmad Assaf, Aline Senart and Raphaël Troncy. An Objective Assessment Framework & Tool for Linked Data Quality: Enriching Dataset Profiles with Quality Indicators. In International Journal on Semantic Web and Information Systems (IJSWIS), Special Issue on Dataset Profiling and Federated Search for Linked Data, 12(3), pages 111-133, 2016 (doi). Houda Khrouf and Raphaël Troncy. EventMedia: a LOD Dataset of Events Illustrated with Media . In Semantic Web journal (SWJ), Special Issue on Linked Dataset descriptions, 7(2), pages 193-199, 2016. Giuseppe Rizzo, Federico Tomassetti, Antonio Vetrò, Luca Ardito, Marco Torchiano, Maurizio Morisio and Raphaël Troncy. Semantic Enrichment for Recommendation of Primary Studies in a Systematic Literature Review. In Digital Scholarship in the Humanities (DSH), 2015 (doi). Leon Derczynski, Diana Maynard, Giuseppe Rizzo, Marieke van Erp, Genevieve Gorrell, Raphaël Troncy, Johann Petrak and Kalina Bontcheva. Analysis of Named Entity Recognition and Linking for Tweets. In Information Processing & Management (IPM), 51(2), pages 32-49, 2015 (doi, arxiv). Houda Khrouf and Raphaël Troncy. De la modélisation sémantique des événements vers l'enrichissement et la recommandation.In Revue d'Intelligence Artificielle (RIA), 28(2-3), pages 321-347, 2014 (doi). Houda Khrouf, Vuk Milicic and Raphaël Troncy. Mining Events Connections on the Social Web: Real-Time Instance Matching and Data Analysis in EventMedia. In Journal of Web Semantics (JWS), 24(1), pages 3-10, 2014 (doi). Dong Wang, Simon King, Joe Frankel, Ravichander Vipperla, Nicholas Evans and Raphaël Troncy. Direct posterior confidence for out-of-vocabulary spoken term detection. ACM Transactions on Information Systems (TOIS), 30(3), pages 16:1-16:34, 2012 (doi). Nicholas Evans, Simon Bozonnet, Dong Wang, Corinne Fredouille and Raphaël Troncy. A Comparative study of bottom-up and top-down approaches to speaker diarization. IEEE Transactions On Acoustics Speech and Language Processing (TASLP), Special Issue on New Frontiers in Rich Transcription, 20(2), pages 382-392, 2012 (doi). Raphaël Troncy. OWL, un "chouette" langage pour représenter des ontologies. In Documentaliste - Sciences de l'information, 48(4), pages 34, 2012. Erik Mannens, Davy Van Deursen, Raphaël Troncy, Silvia Pfeiffer, Conrad Parker, Yves Lafon, Jack Jansen, Michael Hausenblas and Rik Van de Walle. A URI-Based Approach for Addressing Fragments of Media Resources on the Web. In Multimedia Tools and Applications (MTAP), 59(2), pages 691-715, 2012 (doi). Raphaël Troncy, Werner Bailer, Michael Hausenblas and Martin Hoffernig. 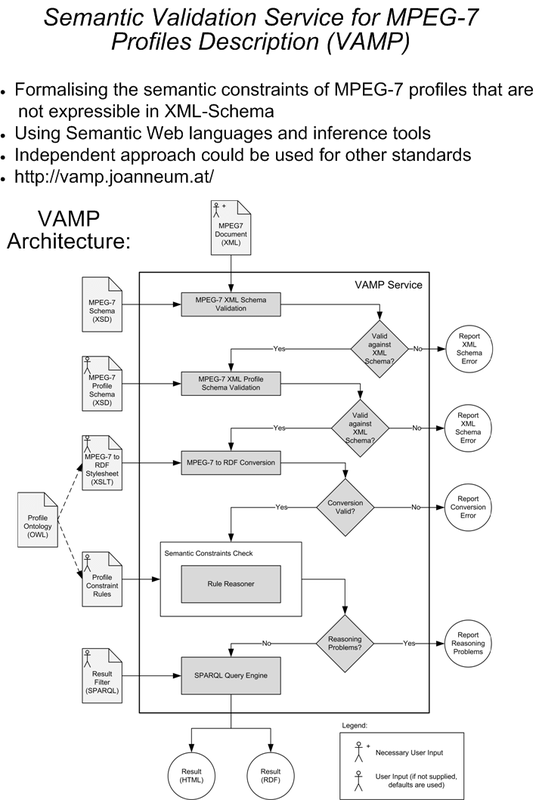 VAMP: a service for validating MPEG-7 descriptions w.r.t. to formal profile definitions. In Multimedia Tools and Applications (MTAP), 46(2), pages 307-329, 2010 (doi). Raphaël Troncy. Creating, Organising and Publishing Media on the Web. In ERCIM News, vol. 72, pages 27-28, 2008. Raphaël Troncy. Nouveaux outils et documents audiovisuels : les innovations du web sémantique. In Documentaliste - Sciences de l'information, 42(6), pages 392-404, 2005. Jean Charlet, Bruno Bachimont and Raphaël Troncy. Ontologies pour le Web sémantique. In Revue I3, numéro Hors Série «Web sémantique», 2004. Yolanda Gil and and Raphaël Troncy. Introduction to the special issue on "Geospatial Semantics". In Journal of Web Semantics, 35(1), pages 1-2, 2015. Alain Mille, Sylvie Szulman and Raphaël Troncy. Introduction to the special issue on "Ingénierie des Connaissances". In Revue d'Intelligence Artificielle, 28(2-3), pages 165-166, 2014 (doi). Raphaël Troncy, Balakrishnan Prabhakaran and Yu Cao. Introduction to the special issue on "Multimedia Data Semantics". In Multimedia Tools and Applications, 59(2), pages 579-583, 2012 (doi). Phivos Mylonas, Maria Bielikova, Yiannis Kompatsiaris and Raphaël Troncy. Introdution to the special issue on "Semantic Media Adaptation & Personalization". In International Journal on Semantic Web and Information Systems, 6(1), pages i-iv, 2010. Yannis Avrithis, Noel O'Connor, Steffen Staab and Raphaël Troncy. Introduction to the special issue on "Semantic Multimedia". In Journal of Web Semantics, 6(2), pages 137-138, 2008 (doi). Yannis Avrithis, Noel O'Connor, Steffen Staab and Raphaël Troncy. Introduction to the special issue on "Semantic Multimedia". In Multimedia Tools and Applications, 39(2), pages 143-147, 2008 (doi). Peter Schallauer, Werner Bailer, Raphaël Troncy and Florian Kaiser. Multimedia metadata standards. In Multimedia Semantics: Metadata, Analysis and Interaction, 1st ed., Raphaël Troncy, Benoît Huet, Simon Schenk (Eds. ), pages 129-143, July 2011, Wiley, ISBN: 978-0-470-74700-1. Thomas Franz, Raphaël Troncy and Miroslav Vacura. The core ontology for multimedia. In Multimedia Semantics: Metadata, Analysis and Interaction, 1st ed., Raphaël Troncy, Benoît Huet, Simon Schenk (Eds. ), pages 145-160, July 2011, Wiley, ISBN: 978-0-470-74700-1. Carsten Saathoff, Krishna Chandramouli, Werner Bailer, Peter Schallauer and Raphaël Troncy. Multimedia annotation tools. In Multimedia Semantics: Metadata, Analysis and Interaction, 1st ed., Raphaël Troncy, Benoît Huet, Simon Schenk (Eds. ), pages 223-239, July 2011, Wiley, ISBN: 978-0-470-74700-1. Lyndon Nixon, Stamatia Dasiopoulou, Jean-Pierre Evain, Eero Hyvönen, Yiannis Kompatsiaris and Raphaël Troncy. Multimedia, Broadcasting and eCulture. In Handbook of Semantic Web Technologies, 1st ed., John Domingue, Dieter Fensel, James A. Hendler (Eds. ), pages 911-976, 2011 (doi). Springer Verlag. Richard Arndt, Raphaël Troncy, Steffen Staab and Lynda Hardman. COMM: A Core Ontology for Multimedia Annotation. In Handbook on Ontologies, 2nd ed., Series: International Handbooks on Information Systems, Steffen Staab, Rudi Studer (Eds. ), pages 403-421, 2009 (doi). Springer Verlag. Steffen Staab, Ansgar Scherp, Richard Arndt, Raphaël Troncy, Marcin Grzegorzek, Carsten Saathoff, Simon Schenk and Lynda Hardman. Semantic Multimedia. In Reasoning Web, 4th International Summer School, Venice, Italy, September 7-11, 2008, Tutorial Lectures, pages 125-170, 2008 (doi). Springer Verlag. Jérôme Euzenat and Raphaël Troncy. Web sémantique et pratiques documentaires. In Publier sur Internet, Sciences et Techniques de l'Information, chapter 5, pages 157-188, 2004. ADBS editions. Pasquale Lisena and Raphaël Troncy. DOing REusable MUSical data (DOREMUS). In 9th International Conference on Knowledge Capture (K-CAP 2017), Austin, Texas, USA, December 4-6, 2017. Julien Plu, Giuseppe Rizzo and Raphaël Troncy. All Models for One Purpose and One Purpose for All Models: Enhancing Entity Linking by Combining Models. In 13th European Semantic Web Conference (ESWC'16), Open Extraction Challenge, Heraklion, Greece, May 29-June 2, 2016. Filip Ilievski, Giuseppe Rizzo, Marieke van Erp, Julien Plu and Raphaël Troncy. Context-enhanced Adaptive Entity Linking (proceedings). In 10th International Conference on Language Resources and Evaluation (LREC'16), Portoroz, Slovenia, May 23-28, 2016. José Luis Redondo Garcia, Giuseppe Rizzo and Raphaël Troncy. Capturing News Stories Once, Retelling a Thousand Ways. In 8th International Conference on Knowledge Capture (K-CAP 2015), Short Paper (see also the poster), Palisades, NY, USA, October 7-10, 2015. Giuseppe Rizzo, Oscar Corcho, Raphaël Troncy, Julien Plu, Juan Carlos Ballesteros Hermida and Ahmad Assaf. The 3cixty Knowledge Base for Expo Milano 2015. In 8th International Conference on Knowledge Capture (K-CAP 2015), Short Paper (see also the poster), Palisades, NY, USA, October 7-10, 2015. Gabriel Kepeklian, Raphaël Troncy and Laurent Bihanic. Datalift: A Platform For Integrating Big and Linked Data. In International Conference on Big Data from Space (BIDS'14), pages 370-374, Rome, Italy, November 12-14, 2014 (doi). Sven Buschbeck, Raphaël Troncy, Anthony Jameson, Houda Khrouf, Adrian Spirescu, Osma Suominen, Tanja Schneeberger and Eero Hyvönen. Parallel Faceted Browsing. In ACM Conference on Human Factors in Computing Systems (CHI'13), Interactivity Track, Paris, France, April 27-May 2, 2013. Symeon Papadopoulos, Emmanouil Schinas, Vasileios Mezaris, Raphaël Troncy and Ioannis Kompatsiaris. The 2012 Social Event Detection Dataset. In ACM Multimedia Systems (MMSys'13), Dataset Session, Oslo, Norway, February 27-March 1, 2013 (doi). Simon Bozonnet, Dong Wang, Nicholas Evans and Raphaël Troncy. Linguistic Influences on Bottom-up and Top-down Clustering for Speaker Diarization. In 36th International Conference on Acoustics, Speech and Signal Processing (ICASSP'11), pages 4424-4427, Prague, Czech Republic, May 22-27, 2011. Dong Wang, Nicholas Evans, Raphaël Troncy and Simon King. Handling Overlaps in Spoken Term Detection. In 36th International Conference on Acoustics, Speech and Signal Processing (ICASSP'11), pages 5656-5659, Prague, Czech Republic, May 22-27, 2011. Pierre-Antoine Champin, Benoît Encelle, Nicholas Evans, Raphaël Troncy, Magali O. Beldame and Yannick Prié. Towards Collaborative Annotation for Video Accessibility. In 7th International Cross-Disciplinary Conference on Web Accessibility (W4A'10), Raleigh, North Carolina, USA, April 26-27, 2010 (doi). Lynda Hardman, Jacco van Ossenbruggen, Raphaël Troncy, Alia Amin and Michiel Hildebrand. Interactive Information Access on the Web of Data. In 1st Web Science Conference - Society On-Line (WebSci'09), Athens, Greece, March 18-20, 2009. Miroslav Vacura, Vojtech Svatek, Carsten Saathoff, Thomas Franz and Raphaël Troncy. Describing Low-Level Image Features Using The COMM Ontology. In 15th IEEE International Conference on Image Processing (ICIP'08), pages 49-52, San Diego, California, USA, October 12-15, 2008 (doi). Jean Delahousse, Rodolphe Bailly and Raphaël Troncy. DOREMUS: Doing Reusable Musical Data. In Semantic Web in Libraries, Hamburg, Germany, December 4-6, 2017. Pasquale Lisena and Raphaël Troncy. Combining Music Specific Embeddings for Computing Artist Similarity. In 18th International Society for Music Information Retrieval Conference (ISMIR'17), Late Breaking Results Track, Suzhou, China, October 23-28, 2017. Pasquale Lisena, Raphaël Troncy, Konstantin Todorov and Manel Achichi. Modeling The Complexity of Music Metadata in Semantic Graphs for Exploration and Discovery. In (ISMIR'17) International Workshop on Digital Libraries for Musicology (DLfM'17), Suzhou, China, October 23-28, 2017 (doi). Olfa Ben Ahmed, Gabriel Sargent, Florian Garnier, Benoit Huet, Vincent Claveau, Laurence Couturier, Raphaël Troncy, Guillaume Gravier, Philémon Bouzy and Fabrice Leménorel. NexGen-TV: Providing Real-Time Insights During Political Debates in a Second Screen Application. In 25nd ACM International Conference on Multimedia (ACMMM'17), Demo Track, Moutain View, California, USA, October 23-27, 2017 (doi) Best Demo Award. Benjamin Klotz, Pasquale Lisena, Raphaël Troncy, Daniel Wilms and Christian Bonnet. DrIveSCOVER: A tourism recommender system based on external driving factors. In 16th International Semantic Web Conference (ISWC'17), Poster Track, Vienna, Austria, October 21-25, 2017. Pasquale Lisena, Lorenzo Canale, Fabio Ellena and Raphaël Troncy. CityMus: Music Recommendation when Exploring a City. In 16th International Semantic Web Conference (ISWC'17), Poster Track, Vienna, Austria, October 21-25, 2017. Enrico Palumbo, Giuseppe Rizzo, Raphaël Troncy and Elena Baralis. Predicting Your Next Stop-over from Location-based Social Network Data with Recurrent Neural Networks. In (RecSys'17) 2nd International Workshop on Recommenders in Tourism (RecTour'17), CEUR Proceedings Vol. 1906, pages 1-8, Como, Italy, August 27-31, 2017. Enrico Palumbo, Efstratios Sygkounas, Raphaël Troncy and Giuseppe Rizzo. SentiME++ at SemEval-2017 Task 4A: Stacking State-of-the-Art Classifiers to Enhance Sentiment Classification. In (ACL'17) 11th International Workshop on Semantic Evaluation (SemEval'17), pages 648-652, Vancouver, Canada, August 3-4, 2017. Emilie Palagi, Fabien Gandon, Alain Giboin and Raphaël Troncy. A Survey of Definitions and Models of Exploratory Search. In (IUI'17) Workhop on Exploratory Search and Interactive Data Analytics (ESIDA'17), Limassol, Cyprus, March 13-16, 2017 (doi). Pasquale Lisena and Raphaël Troncy. DOREMUS to Schema.org: Mapping a Complex Vocabulary to a Simpler One. In 20th International Conference on Knowledge Engineering and Knowledge Management (EKAW'16), Poster Track (see also the poster), Bologna, Italy, November 19-23, 2016. Pasquale Lisena, Manel Achichi, Eva Fernández, Konstantin Todorov and Raphaël Troncy. Exploring Linked Classical Music Catalogs with OVERTURE. In 15th International Semantic Web Conference (ISWC'16), Poster Track (see also the poster), Kobe, Japan, October 17-21, 2016. Marie Destandau, Raphaël Troncy, Konstantin Todorov, Cécile Cecconi, Martine Voisin, Isabelle Canno and Françoise Leresche. Linked Data Approach for Structuring and Interlinking Musical Catalogs: How Three Major French Cultural Institutions Finally Came to an Agreement. In (IFLA'16) Workshop on Data In Libraries: The Big Picture, Chicago, USA, August 10, 2016. Enrico Palumbo, Giuseppe Rizzo and Raphaël Troncy. An Ensemble Approach to Financial Entity Matching for the FEIII 2016 Challenge. In (SIGMOD/PODS'16) 2nd International Workshop on Data Science for Macro-Modeling (DSMM'16), San Francisco, USA, July 1, 2016 (doi). Nandana Mihindukulasooriya, Giuseppe Rizzo, Raphaël Troncy, Oscar Corcho and Raul Garcia-Castro. A Two-Fold Quality Assurance Approach for Dynamic Knowledge Bases. In (ESWC'16) International Workshop on Completing and Debugging the Semantic Web (CoDeS'16), CEUR Proceedings Vol. 1586, Heraklion, Greece, May 30, 2016. Giuseppe Rizzo, Marieke van Erp, Julien Plu and Raphaël Troncy. NEEL 2016: Named Entity rEcognition & Linking Challenge Report. In (WWW'16) 6th International Workshop on Making Sense of Microposts (Microposts'16), NEEL Challenge, CEUR Proceedings Vol. 1691, Montreal, Canada, April 12 2016. Raphaël Troncy. Linking Entities for Enriching and Structuring Social Media Content. In (WWW'16) 2nd International Workshop on Natural Language Processing for Informal Text (NLPIT'16), page 597, Montreal, Canada, April 12 2016. Manel Achichi, Rodolphe Bailly, Cécile Cecconi, Marie Destandau, Konstantin Todorov and Raphaël Troncy. DOREMUS: Doing Reusable Musical Data. In 14th International Semantic Web Conference (ISWC'15), Poster Track (see also the poster), CEUR Proceedings Vol. 1486, Bethlehem, PA, USA, October 11-15, 2015. Julien Plu, Giuseppe Rizzo and Raphaël Troncy. An Experimental Study of a Hybrid Entity Recognition and Linking System. In 14th International Semantic Web Conference (ISWC'15), Poster Track (see also the poster), CEUR Proceedings Vol. 1486, Bethlehem, PA, USA, October 11-15, 2015. Julien Plu, Giuseppe Rizzo and Raphaël Troncy. Revealing Entities from Textual Documents Using a Hybrid Approach. In 3rd NLP&DBpedia International Workshop (NLP&DBpedia 2015), Bethlehem, PA, USA, October 11-15, 2015. Ahmad Assaf, Raphaël Troncy and Aline Sénart. What's up LOD Cloud - Observing The State of Linked Open Data Cloud Metadata. In 2nd Workshop on Linked Data Quality (LDQ 2015), Portoroz, Slovenia, May 31-June 4, 2015. Ahmad Assaf, Raphaël Troncy and Aline Sénart. HDL - Towards a Harmonized Dataset Model for Open Data Portals. In 2nd International Workshop on Dataset PROFIling & fEderated Search for Linked Data (PROFILES 2015), Portoroz, Slovenia, May 31-June 4, 2015. Ahmad Assaf, Aline Sénart and Raphaël Troncy. Roomba: Automatic Validation, Correction and Generation of Dataset Metadata. In 24th World Wide Web Conference (WWW'15), Demos Track, pages 159-162, Florence, Italy, May 18-22, 2015 (doi). José Luis Redondo Garcia, Mariela Sabatino, Pasquale Lisena and Raphaël Troncy. Finding and sharing hot spots in Web Videos. In 13th International Semantic Web Conference (ISWC'14), Demo Track, CEUR Proceedings Vol. 1272, pages 141-144, Riva del Garda, Italy, October 21-23, 2014. Ghislain Atemezing and Raphaël Troncy. Towards a Linked-Data based Visualization Wizard. In (ISWC'14) 5th International Workshop on Consuming Linked Data (COLD'14), CEUR Proceedings Vol. 1264, Riva del Garda, Italy, October 20, 2014. Giuseppe Rizzo, Marieke van Erp and Raphaël Troncy. Inductive Entity Typing Alignment. In (ISWC'14) 1st International Workshop on Linked Data for Information Extraction (LD4IE'14), CEUR Proceedings Vol. 1267, pages 55-66, Riva del Garda, Italy, October 20, 2014. Ghislain Atemezing, Nathalie Abadie, Raphaël Troncy and Bénédicte Bucher. Publishing Reference Geodata on the Web: Opportunities and Challenges for IGN France. In (ISWC'14) 6th International Workshop on the Foundations, Technologies and Applications of the Geospatial Web (TerraCognita'14), Riva del Garda, Italy, October 19, 2014. Lyndon Nixon and Raphaël Troncy. LinkedTV: Web and TV seamlessly interlinked using semantic technology. In 11th Extended Semantic Web Conference (ESWC'14), EU Project Networking Track, Anissaras, Crete, May 25-29, 2014. Ahmad Assaf, Ghislain Atemezing, Raphaël Troncy and Elena Cabrio. What are the Important Properties of an Entity? Comparing Users and Knowledge Graph Point of View. In 11th Extended Semantic Web Conference (ESWC'14), Demos Track, LNCS 8798, pages 190-194, Anissaras, Crete, May 25-29, 2014. Elena Cabrio, Vivek Sachidananda and Raphaël Troncy. Boosting QAKiS with multimedia answer visualization. In 11th Extended Semantic Web Conference (ESWC'14), Demos Track, vol. LNCS 8798, pages 298-303, Anissaras, Crete, May 25-29, 2014. José Luis Redondo-Garcia, Michiel Hildebrand, Lilia Perez Romero and Raphaël Troncy. Augmenting TV Newscasts via Entity Expansion. In 11th Extended Semantic Web Conference (ESWC'14), Demos Track, vol. LNCS 8798, pages 472-476, Anissaras, Crete, May 25-29, 2014. Giuseppe Rizzo, Giacomo Falcone, Rosa Meo, Ruggero Pensa, Raphaël Troncy and Vuk Milicic. Geographic Summaries from Crowdsourced Data. In 11th Extended Semantic Web Conference (ESWC'14), Demos Track, vol. LNCS 8798, pages 477-481, Anissaras, Crete, May 25-29, 2014. Lyndon Nixon and Raphaël Troncy. Survey of Semantic Media Annotation Tools for the Web: Towards new Media Applications with Linked Media. In (ESWC'14) 2nd International Workshop on Linked Media (LiME'14), vol. LNCS 8798, pages 100-114, Anissaras, Crete, May 25, 2014. Yunjia Li, Raphaël Troncy, Mike Wald and Gary Wills. Media Fragments Indexing using Social Media. In (ESWC'14) 2nd International Workshop on Linked Media (LiME'14), Anissaras, Crete, May 25, 2014. Lyndon Nixon, Vasileios Mezaris and Raphaël Troncy. Re-using Media on the Web. In 23rd International World Wide Web Conference (WWW'14), Tutorial's Track, pages 201-202, Seoul, South Korea, April 7-11, 2014 (doi). Federico Tomassetti, Giuseppe Rizzo and Raphaël Troncy. CrossLanguageSpotter: A Library for Detecting Relations in Polyglot Frameworks. In 23rd International World Wide Web Conference (WWW'14), Developer's Track, pages 583-586, Seoul, South Korea, April 7-11, 2014. José Luis Redondo García, Laurens De Vocht, Raphaël Troncy, Erik Mannens and Rik Van de Walle. Describing and Contextualizing Events in TV News Show. In (WWW'14) 2nd International Workshop on Social News on the Web (SNOW'14), pages 759-764, Seoul, South Korea, April 7, 2014 (doi). Carlo Andrea Conte, Raphaël Troncy and Mor Naaman. Extracting Resources that Help Tell Events' Stories. In (ICMR'14) 1st International Workshop on Social Multimedia and Storytelling (SoMuS'14), CEUR Proceedings Vol. 1198, Glasgow, Scotland, April 1, 2014. Vasileios Mezaris, Georgios Petkos, Symeon Papadopoulos, Raphaël Troncy, Philipp Cimiano, Timo Reuter and Yiannis Kompatsiaris. Social Event Detection at MediaEval: a 3-year retrospect of tasks and results. In (ICMR'14) 1st International Workshop on Social Events in Web Multimedia (SEWM'14), Glasgow, Scotland, April 1, 2014. Jan Thomsen, Raphaël Troncy and Lyndon Nixon. Linking Web Content Seamlessly with Broadcast Television: Issues and Lessons Learned. In 4th W3C Workshop on Web and TV, Munich, Germany, March 12-13, 2014. Raphaël Troncy, Ghislain Auguste Atemezing, Nathalie Abadie and Cao-Vien Lam. Modeling Geometry and Reference Systems on the Web of Data. In W3C Workshop on Linking Geospatial Data, London, UK, March 5-6, 2014. Giuseppe Rizzo, Marieke van Erp and Raphaël Troncy. Evaluating Named Entity Recognition and Disambiguation in News and Tweets. In 24th Meeting of Computational Linguistics in The Netherlands (CLIN'14), Leiden, The Netherlands, January 17, 2014. Ghislain Atemezing, Bernard Vatant, Raphaël Troncy and Pierre-Yves Vanderbussche. Harmonizing services for LOD vocabularies: a case study. In (ISWC'13), International Workshop on Semantic Web Enterprise Adoption and Best Practice (WaSaBi'13), CEUR Proceedings Vol. 1106, Sydney, Australia, October 22, 2013. José Luis Redondo Garcia and Raphaël Troncy. Television meets the Web: a Multimedia Hypervideo Experience. In 12th International Semantic Web Conference (ISWC'13), Doctoral Consortium Track, CEUR Proceedings Vol. 1045, Sydney, Australia, October 22, 2013. Mathilde Sahuguet, Benoit Huet, Barbora Červenková, Evlampios Apostolidis, Vasileios Mezaris, Daniel Stein, Stefan Eickeler, José Luis Redondo Garcia, Raphaël Troncy and Lukáš Pikora. LinkedTV at MediaEval 2013 Search and Hyperlinking Task. In MediaEval Benchmarking Initiative for Multimedia Evaluation, CEUR Proceedings Vol. 1043, Barcelona, Spain, October 18-19, 2013. Daniel Stein, Alp Öktem, Evlampios Apostolidis, Vasileios Mezaris, José Luis Redondo García, Raphaël Troncy, Mathilde Sahuguet, Benoit Huet. From Raw Data to Semantically Enriched Hyperlinking: Recent Advances in the LinkedTV Analysis Workflow. In NEM Summit: Networked & Electronic Media, Nantes, France, October 28-30, 2013. Thomas Steiner and Raphaël Troncy. Tell me why! Ain't nothin' but a~mistake? Describing Media Item Differences with Media Fragments URI and Speech Synthesis. In (ICME'13) 1st International Workshop on Media Fragment Creation and Remixing (MMIX'13), San Jose, USA, July 15-19, 2013. Vuk Milicic, José Luis Redondo Garcia, Giuseppe Rizzo and Raphaël Troncy. Grab your Favorite Video Fragment: Interact with a Kinect and Discover Enriched Hypervideo. In 11th European Interactive TV Conference (EuroITV'13), Demos Track, Como, Italy, June 24-26, 2013. Vuk Milicic, José Luis Redondo Garcia, Giuseppe Rizzo and Raphaël Troncy. Tracking and analyzing the 2013 Italian Election. In 10th Extended Semantic Web Conference - Semantics and Big Data (ESWC'13), Demos Track, pages 258-262, Montpellier, France, May 26-30, 2013. Ahmad Assaf, Aline Sénart and Raphaël Troncy. SNARC: A Semantic Social News Aggregator. In 10th Extended Semantic Web Conference - Semantics and Big Data (ESWC'13), First Prize Winner of the AI Mashup Track, pages 319-326, Montpellier, France, May 26-30, 2013. Anastasia Dimou, Pieter Colpaert, Raphaël Troncy, Erik Mannens and and Rik Van de Walle. Cataloguing Open Data Applications using Semantic Web Technologies. In 10th Extended Semantic Web Conference - Semantics and Big Data (ESWC'13), EU Project Networking Track, Montpellier, France, May 26-30, 2013. Vuk Milicic, Giuseppe Rizzo, José Luis Redondo Garcia, Raphaël Troncy and Thomas Steiner. Live Topic Generation from Event Streams. In 22nd International World Wide Web Conference (WWW'13), Demos Track, Rio de Janeiro, Brazil, May 13-17, 2013. Raphaël Troncy, Vuk Milicic, Giuseppe Rizzo and José Luis Redondo Garcia. MediaFinder: Collect, Enrich and Visualize Media Memes Shared by the Crowd. In (WWW'13) 2nd International Workshop on Real-Time Analysis and Mining of Social Streams (RAMSS'13), Rio de Janeiro, Brazil, May 14, 2013. Yunjia Li, Giuseppe Rizzo, José Luis Redondo Garcia and Raphaël Troncy. Enriching Media Fragments with Named Entities for Video Classification. In (WWW'13) 1st Worldwide Web Workshop on Linked Media (LiME'13), Rio de Janeiro, Brazil, May 13, 2013. Marieke van Erp, Giuseppe Rizzo and Raphaël Troncy. Learning with the Web: Spotting Named Entities on the intersection of NERD and Machine Learning. In (WWW'13) 3rd International Workshop on Making Sense of Microposts (#MSM'13), Concept Extraction Challenge, Rio de Janeiro, Brazil, May 13, 2013. Ghislain Auguste Atemezing, Fabien Gandon, Gabriel Kepeklian, François Scharffe, Raphaël Troncy and Serena Villata. Publishing Linked Data Requires More than Just Using a Tool. In W3C Workshop on Open Data on the Web, London, UK, April 23-24, 2013. Ghislain Auguste Atemezing and Raphaël Troncy. Towards Interoperable Visualization Applications Over Linked Data. In 2nd European Data Forum (EDF'13), Dublin, Ireland, April 9-10, 2013. Yunjia Li, Giuseppe Rizzo, Raphaël Troncy, Mike Wald and Gary Wills. Creating Enriched YouTube Media Fragments With NERD Using Timed-Text. In 11th International Semantic Web Conference (ISWC'12), Demos Track, Boston, USA, November 11-15, 2012. Thomas Steiner, Ruben Verborgh, Raphaël Troncy, Joaquim Gabarro and Rik Van de Walle. Adding Realtime Coverage to the Google Knowledge Graph. In 11th International Semantic Web Conference (ISWC'12), Demos Track, Boston, USA, November 11-15, 2012. Giuseppe Rizzo, Thomas Steiner, Raphaël Troncy, Ruben Verborgh, José Luis Redondo Garcia and Rik Van de Walle. What Fresh Media Are You Looking For? Extracting Media Items from Multiple Social Networks. In (ACM Multimedia) International Workshop on Socially-Aware Multimedia (SAM'12), Nara, Japan, October 29-November 2, 2012. Sven Buschbeck, Anthony Jameson, Raphaël Troncy, Houda Khrouf, Osma Suominen and Adrian Spirescu. A Demonstrator for Parallel Faceted Browsing. In (EKAW) Intelligent Exploration of Semantic Data Workshop (IESD'12), Winner of the IESD Challenge, Galway, Ireland, October 8-12, 2012. Symeon Papadopoulos, Emmanouil Schinas, Vasileios Mezaris, Raphaël Troncy and Ioannis Kompatsiaris. Social Event Detection at MediaEval 2012: Challenges, Dataset and Evaluation. In MediaEval Benchmarking Initiative for Multimedia Evaluation, CEUR Proceedings Vol. 927, Pisa, Italy, October 4-5, 2012. Tobias Rehrl, Raphaël Troncy, Andreas Bley, Susanne Ihsen, Katharina Scheibl, Wolfram Schneider, Sebastian Glende, Stefan Goetze, Jens Kessler, Christoph Hintermueller and Frank Wallhoff. The Ambient Adaptable Living Assistant is Meeting its Users. In AAL Forum 2012, Eindhoven, The Netherlands, September 24-27, 2012. François Scharffe, Ghislain Atemezing, Raphaël Troncy, Fabien Gandon, Serena Villata, Bénédicte Bucher, Fayçl Hamdi, Laurent Bihanic, Gabriel Képéklian, Franck Cotton, Jérôme Euzenat, Zhengjie Fan, Pierre-Yves Vandenbussche and Bernard Vatant. Enabling linked-data publication with the Datalift Platform. In (AAAI'12) Workshop on Semantic Cities, pages 25-30, Toronto, Canada, July 22-26, 2012. Houda Khrouf, Ghislain Atemezing, Giuseppe Rizzo, Raphaël Troncy and Thomas Steiner. Aggregating Social Media for Enhancing Conference Experience. In (ICWSM'12) 1st International Workshop on Real-Time Analysis and Mining of Social Streams (RAMSS'12), pages 34-37, Dublin, Ireland, June 4, 2012. Houda Khrouf, Ghislain Atemezing, Thomas Steiner, Giuseppe Rizzo and Raphaël Troncy. Confomaton: A Conference Enhancer with Social Media from the Cloud. In 9th Extended Semantic Web Conference (ESWC'12), Demos Track, LNCS 7540, pages 463-467, Heraklion, Crete, May 27-31, 2012. Ahmad Assaf, Eldad Louw, Aline Senart, Corentin Follenfant, Raphaël Troncy and David Trastour. RUBIX: a framework for improving data integration with linked data. In 1st International Workshop on Open Data (WOD'12), pages 13-21, Nantes, France, May 25th, 2012 (doi, arxiv, hal). Giuseppe Rizzo and Raphaël Troncy. NERD: A Framework for Unifying Named Entity Recognition and Disambiguation Web Extraction Tools. In 13th Conference of the European Chapter of the Association for computational Linguistics (EACL'12), Demos Track, Avignon, France, April 23-27, 2012. Giuseppe Rizzo, Raphaël Troncy, Sebastian Hellmann and Martin Bruemmer. NERD meets NIF: Lifting NLP Extraction Results to the Linked Data Cloud. In (WWW'12) 5th Workshop on Linked Data on the Web (LDOW'12), Lyon, France, April 16, 2012. Thomas Steiner, Ruben Verborgh, Joaquim Gabarró Vallés, Raphaël Troncy, Michael Hausenblas, Rik Van de Walle and Arnaud Brousseau. Enabling on-the-fly Video Shot Detection on YouTube. In 21st International World Wide Web Conference (WWW'12), Developer's Track, Lyon, France, April 16-20, 2012. Xueliang Liu, Raphaël Troncy and Benoît Huet. Using Social Media to Identify Events. In (ACM Multimedia) 3rd Workshop on Social Media (WSM'11), Scottsdale, Arizona, USA, November 28-December 1st, 2011 (doi). Houda Khrouf and Raphaël Troncy. EventMedia: Visualizing Events and Associated Media. In 10th International Semantic Web Conference (ISWC'11), Demos Track, Bonn, Germany, October 23-27, 2011. Giuseppe Rizzo and Raphaël Troncy. NERD: A Framework for Evaluating Named Entity Recognition Tools in the Web of Data. In 10th International Semantic Web Conference (ISWC'11), Demos Track, Bonn, Germany, October 23-27, 2011. Houda Khrouf and Raphaël Troncy. EventMedia Live: Reconciliating Events Descriptions in the Web of Data. In (ISWC'11) 6th International Workshop on Ontology Matching (OM'11), Bonn, Germany, October 23-27, 2011. Giuseppe Rizzo and Raphaël Troncy. NERD: Evaluating Named Entity Recognition Tools in the Web of Data. In (ISWC'11) Workshop on Web Scale Knowledge Extraction (WEKEX'11), Bonn, Germany, October 23-27, 2011. Symeon Papadopoulos, Raphaël Troncy, Vasileios Mezaris, Benoît Huet and Ioannis Kompatsiaris. Social Event Detection at MediaEval 2011: Challenges, Dataset and Evaluation. In MediaEval Benchmarking Initiative for Multimedia Evaluation, CEUR Proceedings Vol. 807, Pisa, Italy, September 1-2, 2011. Xueliang Liu, Benoît Huet and Raphaël Troncy. EURECOM @ MediaEval 2011 Social Event Detection Task. In MediaEval Benchmarking Initiative for Multimedia Evaluation, CEUR Proceedings Vol. 807, Pisa, Italy, September 1-2, 2011. Thomas Steiner, Arnaud Brousseau and Raphaël Troncy. A Tweet Consumers' Look At Twitter Trends. In (ESWC'11) Making Sense of Microposts Workshop (MSM'11), CEUR Proceedings Vol. 718, Heraklion, Crete, May 29-June 2, 2011. Thomas Steiner, Raphaël Troncy and Michael Hausenblas. How Google is using Linked Data Today and Vision For Tomorrow. In Linked Data in the Future Internet at the Future Internet Assembly, CEUR Proceedings Vol. 700, Ghent, Belgium, December 16-17, 2010. Raphaël Troncy, André Fialho, Lynda Hardman and Carsten Saathoff. Experiencing Events through User-Generated Media. In (ISWC'10) International Workshop on Consuming Linked Data (COLD'10), CEUR Proceedings Vol. 665, Shanghai, China, November 7-11, 2010. Dong Wang, Simon King, Nicholas Evans, Joe Frankel and Raphaël Troncy. Direct Posterior Confidence for Out-of-Vocabulary Spoken Term Detection. In (ACM MM'10) 4th International Workshop on Searching Spontaneous Conversational Speech (SSCS'10), Firenze, Italy, October 29, 2010. André Fialho, Raphaël Troncy, Lynda Hardman, Carsten Saathoff and Ansgar Scherp. What's on this evening? Designing User Support for Event-based Annotation and Exploration of Media. In 1st International Workshop on EVENTS - Recognising and tracking events on the Web and in real life (EVENTS'10), CEUR Proceedings Vol. 624, pages 40-54, Athens, Greece, May 4, 2010. Davy Van Deursen, Raphaël Troncy, Erik Mannens, Silvia Pfeiffer, Yves Lafon and Rik Van de Walle. Implementing the Media Fragments URI Specification. In 19th International World Wide Web Conference (WWW'10), Developer's Track, pages 1361-1364, Raleigh, North Calorina, USA, April 28-30, 2010 (doi). Raphaël Troncy and Jean Luc Dugelay. The Insecurity of Sharing MY Life on the Web: The Butterfly Effect of Images and Videos in Social Networks. In Poster Proceedings of the 2nd Web Science Conference - Extending the Frontiers of Society On-Line (WebSci'10), Raleigh, North Calorina, USA, April 26-27, 2010. Florian Stegmaier, Werner Bailer, Tobias Bürger, Mario Döller, Martin Höffernig, Wonsuk Lee, Véronique Malaisé, Chris Poppe, Raphaël Troncy, Harald Kosch and Rik Van de Walle. How to Align Media Metadata Schemas? Design and Implementation of the Media Ontology. In (SAMT'09) Workshop on Semantic Multimedia Database Technologies (SeMuDaTe'09), CEUR Proceedings Vol. 539, Graz, Austria, December 2, 2009. Erik Mannens, Raphaël Troncy, Karel Braeckman, Davy Van Deursen, Wim Van Lancker, Robbie De Sutter and Rik Van de Walle. Automatic Metadata Enrichment in News Production. In 10th International Workshop on Image Analysis for Multimedia Interactive Services (WIAMIS'09), IEEE Conference Proceedings, pages 61-64, London, UK, May 6-8, 2009 (doi). Michael Hausenblas, Raphaël Troncy, Yves Raimond and Tobias Bürger. Interlinking Multimedia: How to Apply Linked Data Principles to Multimedia Fragments. In (WWW'09) 2nd Workshop on Linked Data on the Web (LDOW'09), CEUR Proceedings Vol. 538, Madrid, Spain, April 20, 2009. Peter Wilkins, Daragh Byrne, Gareth Jones, Hyowon Lee, Gordon Keenan, Kevin McGuinness, Noel O’Connor, Neil O’Hare, Alan Smeaton, Tomasz Adamek, Raphaël Troncy, Alia Amin, Rachid Benmokhtar, Emilie Dumont, Benoit Huet, Bernard Merialdo, Giorgos Tolias, Evaggelos Spyrou, Yannis Avrithis, Georgios Papadopoulous, Vasileios Mezaris, Ioannis Kompatsiaris, Roland Morzinger, Peter Schallauer, Werner Bailer, Krishna Chandramouli, Ebroul Izquierdo, Lutz Goldmann, Martin Haller, Amjad Samour, Andreas Corbet, Thomas Sikora, Pavel Praks, David Hannah, Martin Halvey, Frank Hopfgartner, Robert Villa, P. Punitha, Anuj Goyal and Joemon Jose. K-Space at TRECVid 2008. In Proceedings of the TREC Video Retrieval Evaluation Workshop, October 28, 2008. Miroslav Vacura and Raphaël Troncy. Towards a simplification of COMM-based multimedia annotations. In Poster Proceedings of the 5th International Conference on Formal Ontology in Information Systems (FOIS'08), pages 67-72, Saarbrücken, Germany, October 31- November 3, 2008 (short paper, poster). Raphaël Troncy, Lynda Harman, Jacco van Ossenbruggen and Michael Hausenblas. Identifying Spatial and Temporal Media Fragments on the Web. In W3C Video on the Web Workshop, San Jose, California and Brussels, Belgium, December 12-13, 2007. Raphaël Troncy, Óscar Celma, Suzanne Little, Roberto García and Chrisa Tsinaraki. MPEG-7 based Multimedia Ontologies: Interoperability Support or Interoperability Issue?. In (SAMT'07) Workshop on Multimedia Annotation and Retrieval enabled by Shared Ontologies (MAReSO'07), Genova, Italy, December 5, 2007. Michael Hausenblas, Werner Bailer, Tobias Bürger and Raphaël Troncy. Deploying Multimedia Metadata on the Semantic Web. In Poster and Demo Proceedings of the 2nd International Conference on Semantic and Digital Media Technologies (SAMT'07), CEUR Proceedings Vol. 300, pages 9-10, Genova, Italy, December 5-7, 2007. Martin Höffernig, Michael Hausenblas, Werner Bailer, Raphaël Troncy. VAMP: Semantic Validation of MPEG-7 Profiles. Poster Session at (I-MEDIA'07) Multimedia Metadata Applications Workshop (M3A), Graz, Austria, September 5, 2007 (short paper, poster). Zeljko Obrenovic, Raphaël Troncy and Lynda Hardman. Vocabularies for Description of Accessibility Issues in Mutimodal User Interfaces. In MOG 2007 - CTIT Proceedings of the Workshop on Multimodal Output Generation, pages 117-128, Aberdeen, UK, January 25-26, 2007. Umberto Straccia and Raphaël Troncy. oMAP: An Implemented Framework for Automatically Aligning OWL Ontologies. In 2nd Italian Workshop on Semantic Web Applications and Perspectives (SWAP'05), CEUR Proceedings Vol. 166, Trento, Italy, December 15-16, 2005. Umberto Straccia and Raphaël Troncy. oMAP: Results of the Ontology Alignment Contest. In (K-CAP'05) Workshop on Integrating Ontologies, CEUR Proceedings Vol. 156, pages 92-96, Banff, Canada, October 2, 2005. Antoine Isaac and Raphaël Troncy. Using Several Ontologies for Describing Audio-Visual Documents: A Case Study in the Medical Domain. In (ESWC'05) Workshop on Multimedia and the Semantic Web, Heraklion, Crete, Greece, May 29, 2005. Raphaël Troncy, Jean Carrive, Steffen Lalande and Jean-Philippe Poli. A Motivating Scenario for Designing an Extensible Audio-Visual Description Language. In International Workshop on Multidisciplinary Image, Video, and Audio Retrieval and Mining (CoRIMedia), Sherbrooke, Canada, October 25-26, 2004. Antoine Isaac and Raphaël Troncy. Designing and Using an Audio-Visual Description Core Ontology. In (EKAW'04) Workshop on Core Ontologies in Ontology Engineering, CEUR Proceedings Vol. 118, Whittlebury Hall, Northamptonshire, UK, October 8, 2004. Raphaël Troncy, Antoine Isaac, and Véronique Malaisé. Using XSLT for Interoperability: DOE and The Travelling Domain Experiment. In (ISWC'03) 2nd Workshop Evaluation of Ontology-based Tools (EON'03), CEUR Proceedings Vol. 87, pages 92-102, Sanibel Island, Florida, USA, October 20, 2003. Raphaël Troncy and Antoine Isaac. Semantic Commitment for Designing Ontologies: A Tool Proposal. Poster Session at 1st International Conference on the Semantic Web (ISWC'2002), Sardinia, Italia, June 9-12, 2002 (short paper, poster). Rim Al-Hulou, Olivier Corby, Rose Dieng-Kuntz, Jérôme Euzenat, Carolina Medina Ramirez, Amedeo Napoli, and Raphaël Troncy. Three knowledge representation formalisms for content-based representation of documents. In (KR'02) Workshop on Formal Ontology, Knowledge Representation and Intelligent Systems for the World Wide Web (SemWeb), Toulouse, France, 2002. Sassine Abou-Jaoude, Claude Frasson, Olivier Charra and Raphaël Troncy. On the Application of a Believable Layer in ITS. In (AIED'99) Workshop on Synthetic Agents, Le Mans, France, July 19, 1999. Julien Plu, Raphaël Troncy and Giuseppe Rizzo. ADEL : une méthode adaptative de désambiguïsation d'entités nommées (on HAL). In 28th Journées Francophones d'Ingénierie des Connaissances (IC'17), pages 80-85, Caen, France, July 3-7, 2017. Ghislain Atemezing and Raphaël Troncy. Modélisation des données géographiques dans le web des données (on HAL). In 23rd Journées Francophones d'Ingénierie des Connaissances (IC'12), pages 369-384, Paris, France, June 25-29, 2012. Houda Khrouf and Raphaël Troncy. Réconcilier les événements dans le web de données (on HAL). In 22nd Journées Francophones d'Ingénierie des Connaissances (IC'11), Chambéry, France, May 16-20, 2011. Raphaël Troncy, Ryan Shaw and Lynda Hardman. LODE: une ontologie pour représenter des événements dans le web de données (on HAL). In 21th Journées Francophones d'Ingénierie des Connaissances (IC'10), pages 69-80, Nîmes, France, June 8-11, 2010. Raphaël Troncy. Explorer des actualités multimédia dans le web de données (on HAL). In 20th Journées Francophones d'Ingénierie des Connaissances (IC'09), pages 181-192, Hammamet, Tunisia, May 25-29, 2009. Raphaël Troncy. Aligner automatiquement des ontologies avec oMAP. In DECOR : Passage à l'échelle des techniques de découverte de correspondances, pages 76-82, Namur, Belgium, January 23. Raphaël Troncy, Henrik Nottelmann and Umberto Straccia. Alignement d'ontologies pour OWL-Lite. In 16th Journées Francophones d'Ingénierie des Connaissances (IC'05), pages 229-240, Nice, France, May 31-June 3. Antoine Isaac and Raphaël Troncy. Ontologies et description du contenu de documents AV : Une expérimentation dans le domaine médical. In Atelier Connaissance et Documents Temporels (CDT'05), Nice, France, May 31. Rim Al-Hulou, Olivier Corby, Rose Dieng-Kuntz, Jérôme Euzenat, Carolina Medina Ramirez, Amedeo Napoli, and Raphaël Troncy. Une plate-forme XML pour représenter des documents et leur contenu pour la mise en œuvre du Web sémantique. In Action Spécifique Web Sémantique (AS2W) STIC/CNRS, Paris, France, October 10-11. Raphaël Troncy and Antoine Isaac. DOE : une mise en oeuvre d'une méthode de structuration différentielle pour les ontologies. In 13th Journées Francophones d'Ingénierie des Connaissances (IC'02), pages 63-74, Rouen, France, May 28-30. Raphaël Troncy. Présentation d'un éditeur d'ontologies différentielles multilingues. Poster Session at 12th Journées Francophones d'Ingénierie des Connaissances (IC'01), Grenoble, France, June 25-28, 2001. Valentina Presutti, Eva Blomqvist, Raphaël Troncy, Harald Sack, Ioannis Papadakis and Anna Tordai. Proceedings of the ESWC 2014 Satellite Events, Revised Selected Papers, Lecture Notes in Computer Science, Vol. 8798, Anissaras, Crete, Greece, May 25-29, 2014. Marieke van Erp, Laura Hollink, Raphaël Troncy, Willem Robert van Hage, Pierre van de Laar, David A. Shamma and Lianli Gao. Proceedings of the Third International Workshop on Detection, Representation, and Exploitation of Events in the Semantic Web (DeRiVE'13), CEUR Proceedings Vol. 1123, editors, Sydney, Australia, October 21, 2013. Marieke van Erp, Laura Hollink, Willem Robert van Hage, Raphaël Troncy and David A. Shamma. Proceedings of the Second International Workshop on Detection, Representation, and Exploitation of Events in the Semantic Web (DeRiVE'12), CEUR Proceedings Vol. 902, editors, Boston, USA, November 12, 2012. Martha Larson, Adam Rae, Claire-Helene Demarty, Christoph Kofler, lorian Metze, Raphaël Troncy, Vasileios Mezaris, Gareth J.F. Jones. Working Notes Proceedings of the Multimedia Benchmark Workshop (MediaEval 2011), CEUR Proceedings Vol. 807, editors, Santa Croce in Fossabanda, Pisa, Italy, September 1-2, 2011. Marieke van Erp, Willem Robert van Hage, Laura Hollink, Anthony Jameson and Raphaël Troncy. Proceedings of the First International Workshop on Detection, Representation, and Exploitation of Events in the Semantic Web (DeRiVE'11), CEUR Proceedings Vol. 779, editors, Bonn, Germany, October 23, 2011. Pierre Antoine Champin, Jean Charlet, Nathalie Hernandez and Raphaël Troncy. Proceedings of the French Workshop on Qualitée et Robustesse dans le Web de Données (QetR'11), Chambéry, France, May 17, 2011. Raphaël Troncy, Yiannis Kompatsiaris, Lyndon Nixon and Paola Hobson. Proceedings of the International Workshop on Multimedia Annotation and Retrieval enabled by Shared Ontologies (MAReSO'07), editors, Genova, Italy, December 5, 2007. Raphaël Troncy, Jacco van Ossenbruggen, Giorgos Stamou and Vassilis Tsouvaras. Proceedings of the Semantic Web Annotations for Multimedia (SWAMM'06) International Workshop, editors, Edinburgh, Scotland, May 22, 2006. Yannick Prié and Raphaël Troncy. Proceedings Atelier Connaissance et Documents Temporels (CDT'05) National Workshop, editors, Nice, France, May 31, 2005. Yannick Prié and Raphaël Troncy. Proceedings Modèles documentaires de l'audiovisuel (MDAV'04) National Workshop, editors, La Rochelle, France, June 22, 2004. Raphaël Troncy, Erik Mannens, Silvia Pfeiffer and Davy van Deursen. Media Fragments URI 1.0. W3C Working Draft, 24 June 2010, http://www.w3.org/TR/media-frags/. Raphaël Troncy and Erik Mannens. Use cases and requirements for Media Fragments. W3C Working Draft, 17 December 2009, http://www.w3.org/TR/media-frags-reqs/. Raphaël Troncy, Jacco van Ossenbruggen, Jeff Z. Pan and Giorgos Stamou. Image Annotation on the Semantic Web. Multimedia Semantics Incubator Group Report (XGR), 14 August 2007, http://www.w3.org/2005/Incubator/mmsem/XGR-image-annotation/. Vassilis Tzouvaras, Raphaël Troncy and Jeff Z. Pan. Multimedia Annotation Interoperability Framework. Multimedia Semantics Incubator Group Report Editor's Draft, 14 August 2007, http://www.w3.org/2005/Incubator/mmsem/XGR-interoperability/. Oscar Celma, Stamatia Dasiopoulou, Michael Hausenblas, Suzanne Little, Chrisa Tsinaraki and Raphaël Troncy. MPEG-7 and the Semantic Web. Multimedia Semantics Incubator Group Report Editor's Draft, 14 August 2007, http://www.w3.org/2005/Incubator/mmsem/XGR-mpeg7/. Michael Hausenblas, Susanne Boll, Tobias Bürger, Oscar Celma, Christian Halaschek-Wiener, Erik Mannens and Raphaël Troncy. Multimedia Vocabularies on the Semantic Web. Multimedia Semantics Incubator Group Report (XGR), 24 July 2007, http://www.w3.org/2005/Incubator/mmsem/XGR-vocabularies/. Raphaël Troncy. Formalization of Documentary Knowledge and Conceptual Knowledge With Ontologies: Applying to The Description of Audio-visual Documents. PhD Thesis (in French), University Joseph Fourier-INPG, Grenoble, France, March 5, 2004. PhD Supervisors: Jérôme Euzenat and Bruno Bachimont. Raphaël Troncy. Integrating text – formal representation for the managment of XML documents. Master's Thesis (in French), University Joseph Fourier-INPG, Grenoble, France, June, 2000. See also my Magistere's Thesis. Jean Charlet, Bruno Bachimont and Raphaël Troncy. Ontologies pour le Web Sémantique. Technical Report, Action Spécifique CNRS "Web Sémantique", Paris, France, 2003. Vincent Brunie and Raphaël Troncy. Essais d’utilisation de MPEG-7. Technical Report, Institut National de l'Audiovisuel, Paris, France, 2003. Raphaël Troncy. Etude du manuel d'indexation commun à tous les documentalistes. Technical Report, Institut National de l'Audiovisuel, Paris, France, 2001.